Kruger national park in South Africa is stepping up their game in an effort to save their incredible rhino population from increased poaching activity. In this article we will cover just why such a drastic increase in rhino wardens was necessary and what it hopes to achieve. Kruger national park is one of the biggest game reserves in Africa; it is located in the Limpopo and Mpumalanga provinces in South Africa. The park itself covers an area of 7,523 square miles and was first established on May 31, 1926. The wildlife in Kruger Park is what makes it one of the biggest tourist attractions in the world in addition to being a safe haven for a number of important species. Among the most important species of the Kruger national park are the black and white rhinoceros. Rhinoceros populations everywhere are at risk of poaching, but due to the fact that South Africa is home to more than half of the worlds rhinoceros population it is the hardest hit area. With a good majority of South Africa’s rhinoceros population living in Kruger national park the park has had its own fair share of poachers. In the most recent news headline in early January, 2012 rangers of Kruger national park found eight dead rhino that had been killed by poachers for their horns. Kruger national park has responded to the increased poaching of their rhinos with a two step process. The first and immediate solution has been to employ another 150 additional rangers to patrol the park and keep an eye out for poachers and the safety of the animals in the park. The addition of one hundred and fifty additional park wardens will bring the total number of wardens to six hundred and fifty. The second step, one that may take a little more time, is the construction of a ninety five mile long electric barrier to sit along the border of Mozambique. It is believed that the majority of the poachers that are slaughtering the park’s rhino population are coming in through the Mozambique border and it is their hope that such a fence will discourage poachers from entering the park. Rhinos are slaughtered in the most part for their horns, although occasionally poachers will also sell off other parts of the animal to make additional money off their kill. The most in demand part of the rhino however is its horn. 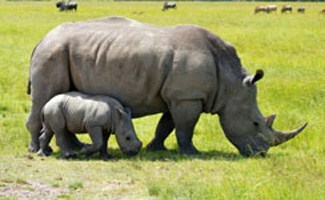 In Asia rhino horn is believed to be something of a miracle cure all that even works in the fight against cancer. The demand for this miracle cure all drug is high and the price that people are willing to pay to get their hands on it is even higher. As these individuals offer large amounts of money, poachers accept the challenge of illegally hunting rhinos to pad their pocketbooks a little more. Rhino horn is also popularly used in ornamental daggers sold in the Middle East. It is currently believed, however, that the Asian demand for the miracle rhino horn is what is driving up the number of poached rhinos in Kruger national park. How Can Poachers Be Stopped? A question that has long been asked and long gone unanswered is how poachers can be stopped. For Kruger national park the current answer is to increase their park security and place an obstacle to the poachers in the form of an electrical fence. For many other local rescue groups the solution to the problem has been deterred by having their rhinos dehorned. An unfortunate process, dehorning surgically removes the horn of the rhino to make them useless to poachers who would otherwise shoot or tranquilize the rhinoceros, cut off the horn and leave the animal to die. It is a shame to remove such a majestic feature of one of nature’s most amazing animals but for some it seems to be the only way to help a struggling species to maintain a steady population. How Are Poachers Taking Rhino Horns? One of the most difficult questions to answer in terms of rhinos being dehorned is just how these animals lose their horns. The process is not difficult to describe because it is unknown, rather it is difficult to describe because it is so heinous. Most often poachers come in to the parks with large tranquilizer guns that they use to take down the massive rhinos. Since these poachers are not trained large animal veterinarians and they generally do not care about the welfare of the creature, they will use whatever tranquilizer they can to take the animal down. Once the rhinoceros is tranquilized the horn will be cut off by poachers using panga machetes. After the horn is removed the traumatized animal is left to die and most often they do die as they are hunted down in remote areas of game reserves and parks where they are not found in time for adequate medical intervention. Currently the South African government has commissioned a study in to the legalization of the trade of rhino horn. It is believed by some that legalizing the trade of the horn will result in far fewer poachers killing off rhinos for their horn since they would be more readily available and the devastation to the rhino population would decrease significantly. Whether or not this idea is a worthwhile one for funding is still up in the air. In 2010 three hundred and thirty three rhinos were poached in South Africa, three hundred and twenty three of these were black rhinos and ten were white rhinos. In 2011 over four hundred rhinos were poached in South Africa alone as the demand for rhino horn has increased. Unfortunately being that South Africa is home to nearly eighty percent of the world’s rhinoceros population it gives poachers more incentive to focus on this particular area for the animals. With Kruger national park being such a large game reserve it is home to a particularly large group of animals including both black and white rhinoceros. A year after Kruger Park in South Africa increased their warden population by 150 new wardens; they face yet another critical concern. In addition to being a thriving park for a healthy rhino population, Kruger Park is also rich in elephants. Unfortunately during the last year as poaching in Africa has continued to grow in popularity thriving elephant populations have been reduced to three specific locations. These three locations: Kruger in South Africa, Chobe in Botswana and Etosha in Namibia have yet remained unscathed by the increase in elephant poaching. Unfortunately, as the area has seen an increase in rhino poaching, it is also preparing for an increase in elephant poaching as well. Since the implementation of the new wardens in Kruger Park, most other areas of Africa have continued to be affected by poaching. Scientists studying the rates of illegal killing of elephants taking place in Africa have released data that indicates just why Kruger Park, Chobe and Etosha should also begin to worry about their elephant populations. According to this data there has been an 80 to 100% increase in elephant poaching in approximately twenty individual areas of Africa that reported back for the study. The majority of these increases have taken place around Uganda, the Congo, the Democratic Republic of the Congo, the Central African Republic and Tanzania. Illegal poaching of elephants has also increased in areas like Namibia, Botswana and Swaziland. Although the increases in poaching around these more southern areas of Africa seem to max out at a 20% increase, the overall increase in poaching is worrisome. Conservationists worry that as elephant populations in these more northern countries become thinned, the richer populations in Kruger, Chobe and Etosha will become main targets. How Has Southern Africa Escaped? The more southern African countries have been significantly less impacted by poaching and the ivory trade in general as a function of the areas wealth. For a long time areas like Botswana, Namibia and South Africa have been financially secure enough to shun the desire for ivory trading. Additionally, these areas had well financed wildlife departments as a function of their prosperity which means that the elephant populations in these areas are more secure than those in more northern sections of the continent. Will Things Change for Southern Africa? One question that comes to mind, particularly for those responsible for protecting wildlife populations in these southern areas of Africa is: will things change? Unfortunately the increase of the ivory trade that has already touched on Botswana indicates that they will. What is responsible for this change? The booming ivory trade will not only have a need for a larger ivory supply, but it has also now become an established commodity for organized crime. After facing devastating destruction of their rhino populations just a year ago, Kruger Park is now preparing themselves yet again only this time they prepare to protect their elephants. Wardens hope that the demand for ivory will drop and save their elephant populations but as the numbers show a moderate increase in elephant poaching in east Africa, southern Africa can only wait with baited breath knowing that their elephants are next. What Type of Devastation Should Be Expected? If the current level of poaching continues, just what type of devastation should be expected for the elephant populations of Kruger Park? One of the most studied elephant populations in Africa is a fairly good indicator of what Kruger Park should expect. The Samburu District of northern Kenya had a thriving elephant population. The animals thrived in peace within the Samburu national reserves; however, soon wardens noticed that the individual elephants were going missing when they left the reserves. The first to disappear were the large bulls that were being targeted for their large tusks. The bull elephant populations were slaughtered so heavily that current elephant populations in the area are at a ratio of two females to every one male. Even these numbers promise to dwindle now that poachers are targeting females as well. As this poaching pattern continues fewer elephant families have the older matriarchs needed to lead them which impacts the social life of those elephants that remain. Can anything be done to Protect Elephant Populations in Kruger Park? With the limited impact of adding more wardens to Kruger Park to protect rhino populations, is there anything that can be done to protect the elephant population within the park? Looking at Kenya as an example, the answer is unfortunately, no. Despite more armed wardens being dispatched to protect elephant populations in Kenya, estimates reveal that 2012 was a record year for elephant poaching. Some researchers believe that as many as 100 elephants per day were killed despite the additional protection of more wardens to protect them. There is a chance for preservation however, and that chance lies in politics. As officials come together to try and find a balance between a limited ivory trade versus a banned ivory trade, it is hoped that attention can be brought to the plight of African elephants. What many hope will come out of this political motion is an awareness of just how much the current ivory demand outweighs the availability of ivory. There simply just aren’t enough elephants in the world to meet the demand of the ivory trade and if changes aren’t made the ivory trade will soon become obliterated. Conservationists hope that this awareness will convince those supportive of the ivory trade to promote conservation of elephant populations in areas such as Kruger Park. While limiting the ivory trade is certainly not the answer that abolitionists were hoping for, it does offer hope for the remaining thriving elephant populations will go unscathed and this is certainly preferable over complete extinction. Is a regulated ivory trade realistic though? With illegal poaching out of control, the reality of the situation is that regulating the ivory trade is not a realistic one. So for now researchers continue to push awareness through monitoring of current elephant populations and increases in poaching. It may be though; that this push can lead to increased awareness among those who can financially support conservation efforts and the elephants of Kruger Park can continue to thrive.